One good and one disappointing outing in the home theater are on tap for pre-Christmas release – a surprisingly good sequel and a movie that can't seem to get past the cuteness of its title to make a compelling lighthearted kids "horror" flick. The two, Columbia's Men in Black 3 and Alliance Atlantis' ParaNorman, are both available in either 3D or 2D versions. 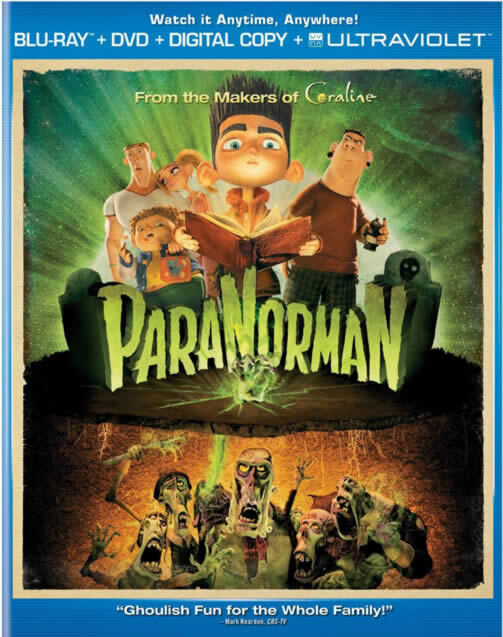 I watched the 2D versions and both films both do a nice job of delivering a cinema-like experience to the home theater, though I think ParaNorman has the better picture quality of the two. Which is too bad, because I didn't like it nearly as much as I did MIB3, and doesn't that just figure? ParaNorman is a bit of a morality tale (anti bullying, pro tolerance – typical PC stuff) in which Norman, who can see and hear dead people, must save his town from a bunch of said dead. Norman is a bit of an outcast, not surprisingly, because everyone thinks he's just weird for talking to his dead grandmother (and other non-corporeal beings). He's bullied at school and even his sister thinks he's strange. Then, as the 300th anniversary of his home town's execution of a witch approaches, Norman inherits from his "crazy" uncle the job of warding off an ancient curse that threatens the town. With the help of his sister and a couple of acquaintances, he must read a story at the grave of the dead witch to prevent her from waking and ruining the town. Yeah, to fight the curse, he has to read a bedtime story. As it turns out, the curse isn't what it seems to be at first, but before everything is resolved happily all heck has to break loose as Norman and his little friends discover the truth and use that knowledge to end the threat. It's quite predictable and liberal, and it also doesn't seem to know if it's a comedy, mild horror film or what. And that's the rub. As a sucker for stop motion animation (and a long time Ray Harryhausen fan) I really hoped ParaNorman would be a great film. I had my doubts because it's supposedly from the same people who made the strangely weird but not particularly compelling Coraline a few years back, but I gave it a chance anyway because – well, I love stop motion. And the animation is fantastic. The look is kind of a blend of Coraline and The Nightmare Before Christmas (both of which – unlike ParaNorman – were directed by Henry Selick) and the painstaking animation, excellent character and set design – and special effects – all combine to make this a movie worth seeing. It's hardly the masterpiece that "Nightmare" is, but it's still worth seeing at least once. The Blu-ray presentation is top notch, with a reference quality 1080p widescreen picture (2.40:1 aspect ratio) that pops off the screen even in 2D. You can make out the individual freckles and other marks on the faces of characters, including the flesh hanging grossly off dead folks' bodies. Colors are rich and deep, and the black levels are fantastic – and you definitely want fantastic black levels with a supposedly spooky movie, much of which happens in the shadows. Lousy black levels mean dark scenes will just be a mess of black, instead of you being able to discern not only the shadows but what's hiding in them as well. The audio track is also excellent. It's presented in a DTS-HD Master Audio encode and during the last half of the film in particular, when "all hell" is breaking loose, the rear channels come alive in a most satisfying way. Fidelity is very good and the low frequency effects channel is used effectively. And dialogue always comes through with good clarity. Extras include an audio commentary from writer/co-director Chris Butler and his directing partner Sam Fell. It's a pretty engaging discussion of what influenced each artist (not surprisingly, a love of stop motion was part of it), as well as some insight into the technical stuff that lets a talented crew bring puppets and miniature sets to life "realistically." There's also a nine part "Peering through the veil" feature that looks at various aspects of the production. And if that isn't enough, you also get seven other featurettes; these ones look at the folks who populate Laika animation studios and there's some really neat footage showing how they make the props, sets and puppets. There's also an early animatic sequence and Universal's "U-Control," which is basically some of the supplements edited together in a way that more closely follows the movie. My review copy also contained a DVD and digital copy. I wanted to like ParaNorman – and it does have a lot to recommend – but I thought that, while it's a wonderful technical achievement and a terrific Blu-ray, its story left a lot to be desired. As has been said many times before, if it ain't on the page it ain't on the stage. 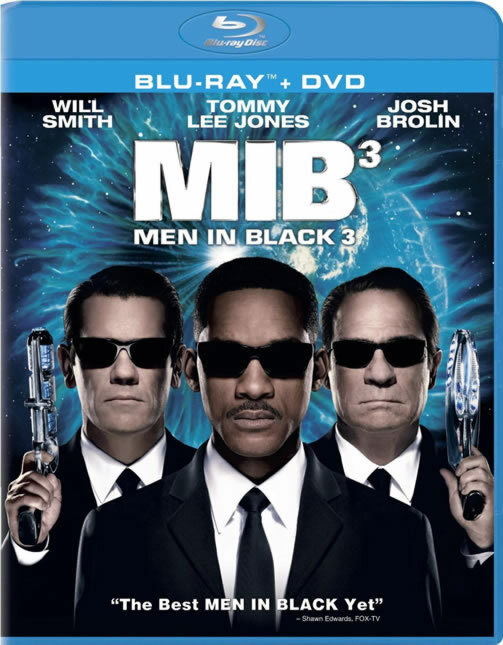 Men in Black 3 was a real surprise, and is a film where "it" was definitely "on the page." The first film in the series was a delight, the second was merely okay, but this third entry, which I was afraid would merely be another example of a studio going through the motions to make a quick billion dollars, is nearly as good as the first. It's a time travel flick in the grand tradition, kind of reminiscent of the Back to the Future movies, especially the second one – and that's a good thing. Here, Agent J (Will Smith) finds himself alone in an altered time line after the big bad alien baddie this time – Boris "the Animal" (Jemaine Clement ) – escapes from the lunar prison agent K (Tommy Lee Jones) put him in decades ago, travels back to before that incident and kills K, thus erasing him from the timeline. And only J notices. It's a neat plot idea and of course it gives us the opportunity to watch J go back to 1969 to prevent K from being killed and thereby restore time to its proper line. So J takes a time jump – literally, as it turns out – so he can prevent Boris (and there are now two of them back there/then) from doing his dastardly deed of altering the time line so significantly that the earth is now (in the altered "present" at the beginning of the film) under alien occupation. Not many of the old characters are back, but we get to see some pretty neat new ones, including a dude who apparently can see all of the potential timelines ahead of him and who gives a kind of running commentary about them as they threaten to unfold. And of course we have Josh Brolin as the young K, and he does a fantastic job here of imitating Tommy Lee Jones' K. It's bang on hilarious and reminded me of Rob Lowe's impression of Robert Wagner in the second Austin Power flick. The 1969 period gives the producers a great opportunity to take us to the Kennedy Space Center for the launch of Apollo 11, the first ship that took men to the moon's surface. And the climactic scene around the giant Saturn V vessel is exciting and extremely well done. In all, MIB3 recaptured the fun of the first entry, and that's just fine with me. It even gives us some interesting back story for both K and J, stuff we wouldn't have suspected before, but which works here even if it is a tad schmaltzy. The Blu-ray is very good, but I was a bit disappointed in the picture quality. Of course it's in 1080p, in this case at an aspect ratio of 1.85:1, and the colors and detail are great. But I was hoping for a razor sharp image all through – a reference quality disc – and other than the opening scene in which Boris escapes from the moon (which is excellent), the rest of the film seems a tad soft. It isn't "don't buy this" soft, but it isn't as good as it could be. The audio track, DTS HD-Master Audio 5.1, is definitely up to snuff, however, powerful and dynamic. It also uses all of the channels very well, immersing you in the action nicely. And if you want deep bass, the LFE channel here is very much alive. My review sample included a DVD, but no digital copy, and it also came with a plethora of extras. There's an HD "making of" feature that's about a half hour long and, despite its short length, is still pretty all-encompassing. The gag reel is, like most of them, pretty lame, and I didn't really care much about the "Back in Time" music video by Pitbull, but it's there if you want it. Or even if you don't, as it turns out. You can use your BD remote to play the rather silly Spot the Alien game, while "The Evolution of Cool: MIB 1960's vs. today" covers how they updated MIB for 2012, then "downdated" it again for the swinging sixties. There's also a decent look at the special effects, which are excellent. Thankfully, MIB 3 isn't just Hollywood cashing in on a franchise. That was MIB 2. This one is a delightful return to form for the series and that's great!